Pudding Stones01263 715779work01603 870304fax Self-cateringSpacious ground floor Victorian apartment tastefully furnished which has some original Victorian features. A good size sitting room with two large comfy sofas, the kitchen is extremely well equipped and has a dining area for two. A perfect romantic getaway with a wonderful Victorian style king size bedroom. Luxury shower room with walk-in thermostatic shower and ambient lighting. Bring your pooches along to this dog-friendly retreat and enjoy all year round beach walks and amazing sunsets. • Family friendly? No, Maximum occupancy two guests, property not suitable for infant/baby. • Other: Towels, Books and games provided. Dog crate available upon request. 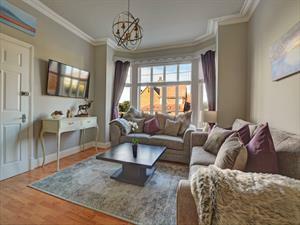 Spacious ground floor Victorian apartment tastefully furnished which has some original Victorian features. A good size sitting room with two large comfy sofas, the kitchen is extremely well equipped and has a dining area for two. A perfect romantic getaway with a wonderful Victorian style king size bedroom. Luxury shower room with walk-in thermostatic shower and ambient lighting. Bring your pooches along to this dog-friendly retreat and enjoy all year round beach walks and amazing sunsets.